At CVisualEvidence, we are confident that once you utilize our deposition services, you will never want to hire anyone else. Our Digital Deposition Recording Workstation™ (DDRW) is a portable, modular workstation designed for efficient, reliable and uniform high definition recording of video depositions. The DDRW features a fully redundant audio and video recording system and features a large 17” high definition monitor and large LED audio bar graph VU meter, positioned for comfortable monitoring of the audio levels and video at one time by the professionally trained deposition videographer. The features of the patent-pending DDRW are designed to improve the deposition recording process, reduce operator fatigue and add capabilities never seen before in a deposition recording system. Our Digital Deposition & Evidence Recording Workstation ™ (DDERW) is our Picture-in-Picture (PIP) recording module that produces a contemporaneous recording of both the electronically displayed exhibits and videos and the deponent simultaneously on the screen. Exhibits are displayed electronically to the deponent and counsel using a high-definition document camera, laptop, iPad or any combination thereof. Two copies of the video deposition are created; a standard-definition version showing only the deponent (4:3 aspect) never showing the exhibit, and a high-definition version (16:9 aspect) showing the document and exhibit full screen with the deponent inserted in an upper corner. 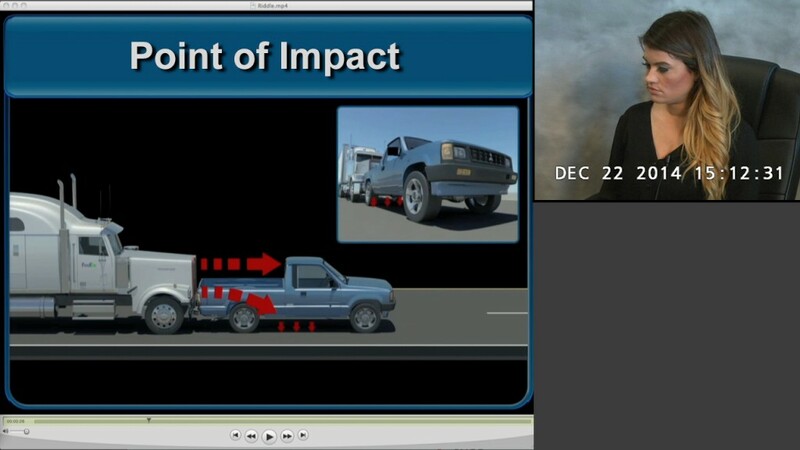 (See example below) Both versions of the video deposition are available with synchronized text and load files for popular trial presentation programs such as TrialDirector and Sanction. Our “No Break Technology” allows for continuous interruption free video recording of over 8 hours. This technology eliminates the necessity for the videographer to interrupt the deposition proceedings to change media units or DVD’s. Our “No Break Technology” gives the advantage to our client, allowing them to take a break when they want to take a break. Currently, most videographers place all deposition participants on the same audio channel(s). In this mode, if an attorney and the deponent speak simultaneously, their audio is merged into a single recorded audio track, usually resulting in a poor or unintelligible audio record. Once this unintelligible recording is created, there is typically no solution to recover the audio and many times enhancement is ineffective. Our “PresenceSafe™” multi-channel audio recording separates the deponent and attorney’s voices onto separate audio channels. This technology allows for interfering audio to be effectively eliminated so the deponents answer is virtually always clear and uninterrupted. This is a DDRW exclusive feature. The DDRW features “One-Button” start/stop technology. This enables the videographer to go on and off the record, starting and stopping all main and backup recorders with the press of a single button. The DDRW features a variable speed pan & tilt remote controlled high-definition video camera. The console mounted joystick gives the operator instant control of the camera without having to reach for (and typically bumping) a tripod mounted camera. This feature enables videographers to react and implement camera adjustments with unprecedented speed and accuracy for the absolute smoothest camera motion. We specialize in the video conversion and text-to-video synchronization of videotaped depositions. Our synchronized files are compatible with all leading trial presentation software, including TrialDirector, Sanction and Visionary. CVisualEvidence provides deposition DVD’s and USB memory sticks using inData Corporation’s DepoView™ Viewer that can be used on any Windows PC. Using this viewer, you can scroll to any page within the transcript and immediately see the video of that testimony. No fast forwarding or rewinding is required. You can even create custom clips and email them to your associates. Relating back to our extensive experience in the courtroom, we are especially aware of problems associated with inaccurate or incomplete text-to-video synchronization. Video depositions synchronized by CVisualEvidence will provide you with the most reliable presentation in the courtroom. We can convert and synchronize video depositions to and from several formats, including MPEG-1, MPEG-2 & MP4 in resolutions from 352×240 through 1920×1080. We welcome large volume cases that require fast turnaround. We are specialists when working with translated depositions. Why choose us for your next deposition? You can call CVisualEvidence to schedule your videotaped depositions and we can schedule the court reporter of your choice. CVisualEvidence works with several of the leading court reporting firms in Southern California so if you don’t have a favorite, we can call schedule one of our affiliate firms. Over the past 25 years, we have seen a switch from professional video companies videotaping most depositions to court reporting firms being responsible for the production, and as a result, we have generally seen the quality of video depositions decline. Because many court reporting firms have no one dedicated to monitoring the consistency and quality of the video depositions their contractors are producing. Many times technical problems are not recognized with the media until preparing for trial. As a company that has prepared thousands of hours of video deposition testimony for use in the courtroom, we regularly receive data from small and large court reporting firms with bad or corrupt data. Today, most court reporting firms are using freelance deposition videographers and require them to provide DVD copies of the depositions. Although this may be a convenient workflow for the court reporting firm, working with antiquated DVD technology is a disadvantage for the attorney. Not only can they be unreliable, but they also require that a videographer interrupt the deposition proceedings in order to change and finalize DVD disks. This process can take several minutes. This is a huge disadvantage for an attorney taking a deposition of an adverse witness, because not only do these interruptions completely disrupt the flow and pace of your deposition, it also allows the witness to confer with counsel, all for an unnecessary interruption to change DVD’s. 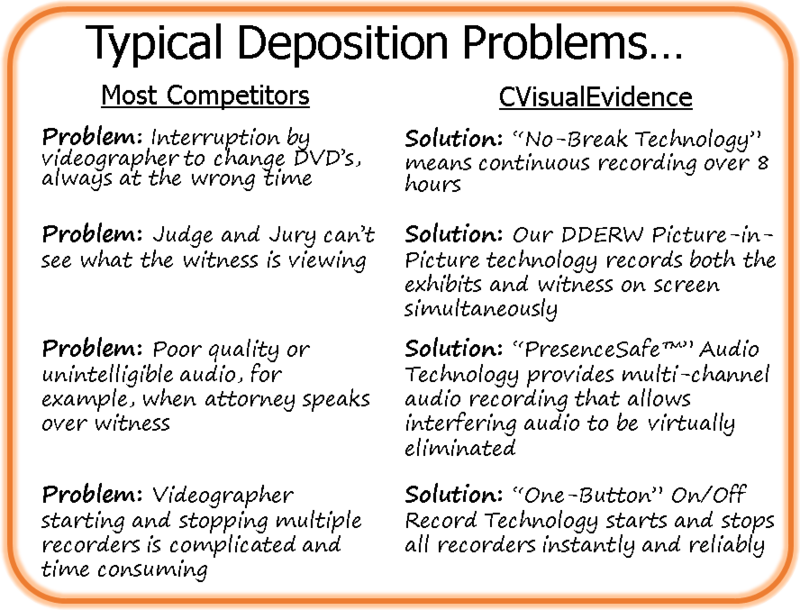 Our exclusive patent-pending Digital Deposition Recording Workstation™ always ensures a no-break deposition recording (That’s Right, No Videographer Interruptions! ), PresenceSafe™ multi-channel audio (Never miss an answer again) and professionally trained videographers by calling CVisualEvidence for your next video deposition. We also offer the ability to record the deponent and evidence simultaneously, using our Picture-in-Picture video deposition recording system. Please read below for details on this state of the art technology only available through CVisualEvidence. North Carolina Killings: What Is a Hate Crime? $8.3M Jail Death Settlement Sets Record in Calif.
What Is Strict Liability? 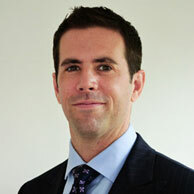 How Does It Affect Injury Lawsuits?